E & H.T. Anthony often exhibited a flare for innovative camera designs. Although not historically interesting, I like the Patent Novelette because it is one of Anthony's "funkier" designs. 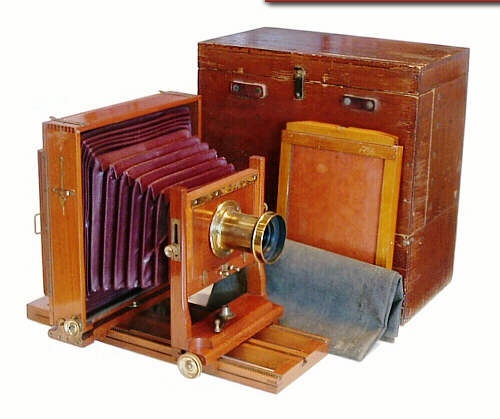 Offered from 1886 to 1894, it is a brass trimmed mahogany view camera made in standard sizes from 4x5 to 11x14. But it is the brass frame supported stereoscopic "round-face" feature that sets Novelette cameras apart from the others. 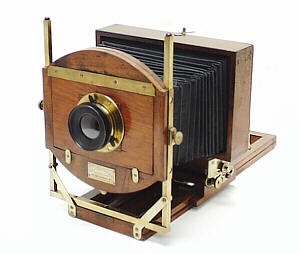 The round-face model was offered as a stereoscopic camera; however, the standard "square face" version could also be adapted for stereo work. 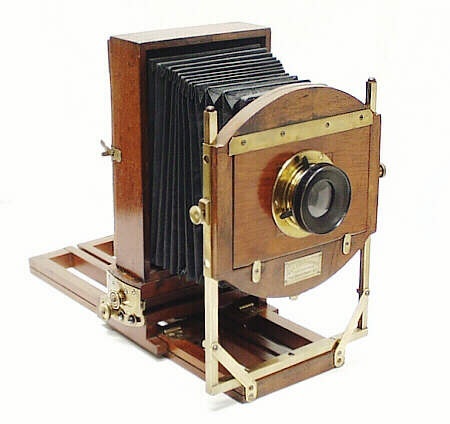 This particular camera is a double-swing, 5x8 inch model with a Darlot WA Hemispherique lens. The round face Novelette sold for $23 in 1891, or the equivalent of $436 in 2000. The Novelette also incorporates the same rotating back and bellows feature found on Anthony's Phantom Camera. The 5x8 camera was also unique because the long bed was designed to accept a larger 8x10 rear standard. Right: Anthony Novelette camera with the back positioned in the landscape orientation.